An IEEE Distinguished Lecture was held on 14th May 2018 at Indian Institute of Science&Technology (IIST) campus Trivandrum. The Distinguished lecture was delivered by Dr. Akshay Kumar Rathore, Associate Professor, Concordia University Canada on ‘Impulse Commutated Frequency Modulated Soft-switching Current-fed Converters’. IEEE IAS-IES-PELS Kerala joint chapter Secretary Prof. K. Biju and IEEE IAS-IES-PEL Kerala joint chapter conference chair Dr. Jaison Mathew were present during the event. IIST IEEE Student branch counsellor and Head of the Avionics Dept., IIST; Dr. Manoj B.S talked a few words about the student branch activities. 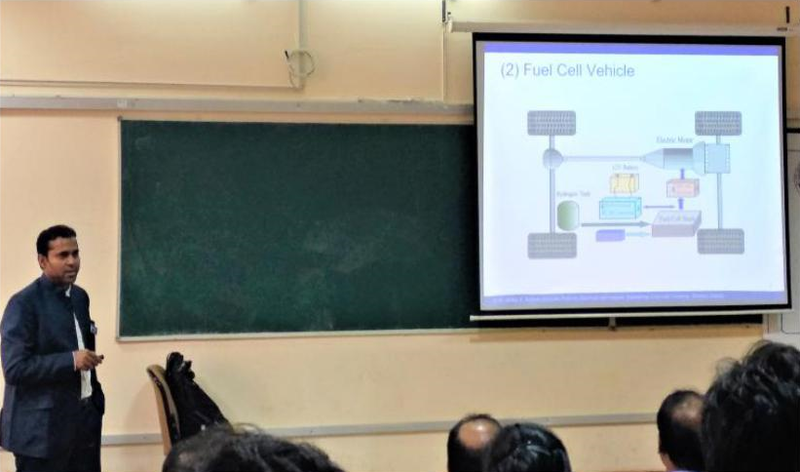 The program was chaired by Dr. Sudarshan Kaarthik, IEEE Industry Applications Society (IAS) student branch chapter Advisor and Assistant Professor of Avionics Department I.I.S.T. Dr. Akshay Kumar Rathore started the Distinguished Lecture by giving a brief introduction about DC-DC converters. The program also included an interactive session after the talk, during which the participants cleared their doubts regarding the topic covered in the talk. Dr. Rajeevan P.P, Associate Professor of Avionics Department I.I.S.T gave felicitation speech. The participants had a visit to Power Electronics Lab after the DL. Total 32 participants including students and professors attended the program. Low-Voltage High Current Application was one of the major topic of the Distinguished Lecture. The various anomalies due to the voltage fed resonant converter were discussed and hence the importance of the Current-fed converters was discussed. The main content of the talk was started with a discussion on Low Voltage High Current Applications. The various applications were discussed along with the working of Impulse Commutated Current fed converters. This uni-directional class of current-fed converters attains soft-switching, zero current commutation, and voltage clamping of switches through a high-frequency resonant tank. It is a simple, cost-effective and easy way of solving the traditional turn-off voltage spike across the devices. The DL was followed by an interactive session with the audience. Various challenges with the soft-switching, voltage fed converters were discussed.